History tells us that many a chess variant came into being as the original game spread from Asia through North Africa and into Europe. The fundamental basic idea is a battle for power between two armies. Chess succeeded everywhere it went because it is the story of human civilization. Every game of chess is a play acted out on a stage of 64 squares. It tells of a struggle between two tribes for dominance and all of the spoils that victory brings. Land, resources, power, wealth, prestige and freedom. Everyone can identify with striving for these goals. Every time chess was carried to a new country it was tailored to suit. The pieces represent important political figures. Their moves reflect that character's power. Unique rules might be put in to symbolize particular customs. Next thing you know you've got a new variant. Write an article on your favorite variant. Xiangqi is Chinese Chess as spoken in the native tongue. It has been around for more than 1,000 years in one form or another. It has changed only slightly over the centuries. There has not been any changes for about 500 years. Visually it looks very different from Western chess. However it is very similar in many ways. Most of the pieces are closely related. Their starting positions and movements are much the same. The pieces move on points rather than squares but it's the same difference really. It's just a matter of adjusting to the optics. Anti Chess has the same board and pieces as Western chess. All of the pieces move the same way too. In fact it's just like normal chess except instead of winning you have to lose! All of the instincts built up playing regular chess need to be turned on their head. You win by losing all of your pieces or by getting your king checkmated. You have to capture when possible and when more than one capture is available you just choose which one to complete. With a completely opposite set of objectives, any position you can think of has a totally different set of properties, possibilities and dangers. Everything is topsy turvy and back to front. Shogi is Japanese chess. The game crossed the Sea of Japan around 1000 A.D. and branched off into various forms. Small Shogi became dominant over all the other sub-variants. Different forms of Shogi are played on various size boards with varying numbers of pieces. The boards range from 7x7 to 36x36 squares in size. The number of pieces range from 32 like in standard chess to 402! In the dominant variant a 9x9 board is used and there are 40 pieces. The most interesting rule in Shogi is probably the drop rule. Captured pieces can be returned to the board to fight on the other side. This comes from historical tradition in Japan where captured warriors often changed allegiance to the enemy as a means of survival. Chaturanga is the oldest known form of chess and is native to India. It's thought to be the ancestor of Western chess and all other chess variants. There is a two player and a four player game. 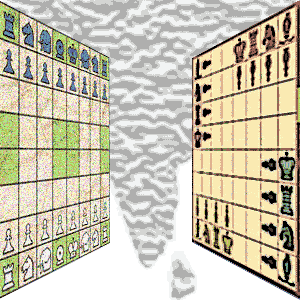 The two player game sets up similar to Western chess. The other has four 8 piece armies setting up in a corner of the board faced toward the army in the corner to the left. In the four player game each army consists of a Boat (equivalent of a Rook), a Knight, a Bishop, a King and four pawns. The King starts on the side nearest the center and the Boat sits in the corner with the Knight beside it. Then the Bishop between Knight and King with the four pawns in front. The two player game later spread to Persia with a few changes and a new name - Shatranj. Then it moved on to North Africa and eventually Spain. In Europe it evolved through some more changes into modern day Western chess. Thai Chess is more commonly called Makruk. It is a close relative of Chaturanga and Shatranj. It has much in common with Western chess. There are also significant differences. The opposite Kings and Queens do not line up on the same file. The Queen always starts to the right of the King and on the same file as the enemy King. The pawns start on the third rank rather than the second. This is Thailand's solution to getting the battle going quickly. It is an alternative instead of allowing the pawn to move two squares on it's first move. Some of the movements differ slightly. The Queen is very weak as in other Asian variants. The Queen was only handed extreme power by the Europeans. Shatranj is the missing link between Chaturanga and Western chess. Our pieces evolved from Shatranj. The Spaniards and Italians altered the moves somewhat in the 1500s. They added a handful of other little things to liven things up. Shatranj gained popularity in Persia soon after it arrived from India. Unlike European chess the Queen is weak and indeed is not a Queen but a Minister. Development is slow because the pawn only moves one square on the first move. Shatranj was played for a thousand years in the Middle East until finally being replaced over the last couple of centuries by a direct descendant - Western chess. Chess960 (Fischer Random Chess) is the most popular form of shuffle chess. It was patented by Bobby Fischer. Fischer was concerned that chess possibilities were close to being exhausted. He feared chess was becoming more of a memory test than a strategic struggle. As a consequence chess was fast becoming dull, boring and predictable. Capablanca had earlier looked at possibilities of adding an extra piece or two into the back row of a slightly bigger board maybe a 9x9 or 10x10. The problem with the bigger board of course was that it would take all day for the two armies to lock horns and get stuck into each other! Fischer came up with a solution that avoided these problems. Instead of adding pieces or enlarging the board he simply randomized the starting position. Korean Chess or Janggi is closely related to Chinese Chess (Xiangqi). Like Xiangqi it is played on points or the intersections of lines. A 10x9 point board to be precise. There is no river on the Korean board. Some of the moves are the same, some are a little different. The Korean elephant is more powerful than the Chinese elephant. The older player takes two soldier pieces, one red, one black. 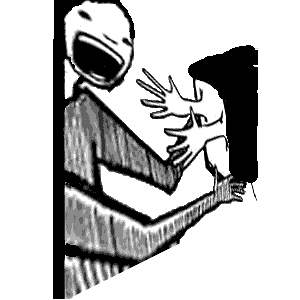 He conceals one in each hand and the younger player chooses a hand. The younger player plays with the side of whichever soldier he chooses. 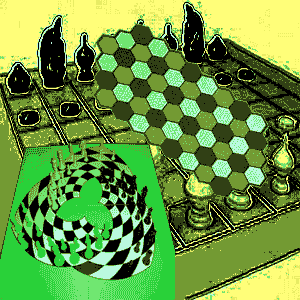 Circular Chess became popular in England in the 1980s when a picture of it was found in a book. It showed a circular chess board from Persia dated around 1000 AD. It has grown slowly but surely since then. The board layout consists of four circular rings of sixteen squares each. It is the same as if the regular square board were cut in half along the d and e files and were then warped and joined together at both ends. Other sub-variants have been developed with even more rings. The pieces set up on the same squares as in regular chess and the rules are broadly the same. The changed environment that the circular board creates makes for a very interesting battle. Because of the different board style the tactics and strategy are completely different. Nothing is as it was before! Martian Chess is a played on an 8x8 chessboard using three different types of pieces. They are Queens, Drones and pawns. Queens can move just like Queens in Western chess. Straight or diagonally with maximum range. Drones move like rooks, straight in any direction, but limited to two squares max at a time. Pawns move one square diagonally at a time. Each player starts with nine pieces and controls one quadrant of the board. That means they have control of any piece that strays onto their patch. Equally, if they move a piece out of their quadrant and into another player's quadrant, they lose control of that piece. Sittuyin is Burmese Chess and it is quite distinctive from Western chess. It is played on an 8x8 board and the pieces are broadly the same. But the moves aren't exactly the same for every piece. Only the pawns are placed on the board in the beginning. 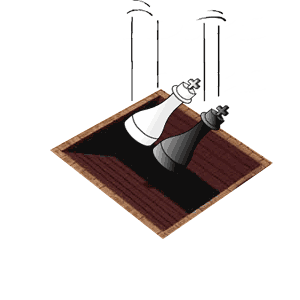 In Western chess players develop their pieces to outposts in well worn opening systems. Sittuyin players simply place their pieces anywhere behind their pawns. The pawns are placed on a3, b3, c3, d3, e4, f4, g4 and h4 for Black playing up the board. Red playing down the board starts his pawns on a5, b5, c5, d5, e6, f6, g6 and h6. Sittuyin historically had many local variants from region to region. This could be one of the main reasons why it has largely been replaced in Burma by Western chess. Hexes Chess gives the traditional chess pieces extra mobility that they did not have before. It does this through a different style of game board. There are different variants of hexes out there where board size and initial set-up vary. You also see some slight movement difference for Knights and pawns but they are only minor alterations. The big difference between Western chess and Hexes chess is the shape of the spaces that the pieces sit on. Hexes chess uses six sided hexagons instead of the traditional four sided squares. The changes this feature brings to the nature of the battle are profound. There are 3 sets of spaces to do battle on instead of just 2! I discuss some of the best known chess variants known to man but there are literally hundreds, maybe thousands out there. And there are new ones emerging all the time. Human imagination and innovation remains constantly at work. For chess this means new variants and sub-variants as old ideas get spun in new and interesting ways. Do you know a great chess variant that the world must hear about? Tell us about your favorite chess variant. Did you find the chess variant you were looking for? It's amazing how many directions and approaches that the basic, fundamental concept of chess can be pulled in. It's so malleable, you can change a few things here, a few things there. The core idea is like putty that you can shape and mold. Next thing you know you have a new game. Just makes you think. Maybe you could come up with your very own chess variant. Do you have any ideas flying around in your head? If you want to talk about this or about numerous other chess topics you can. You can find Invitations to have your say and talk to others down at the Interactive Center.